The posh St. Regis Bal Harbour Resort & Residences officially opened on Thursday, January 19, with markedly less fanfare. 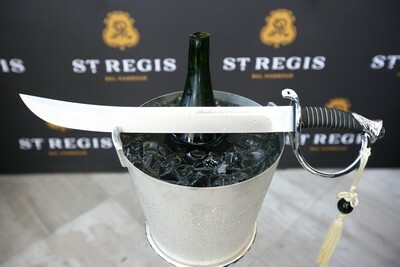 In lieu of a splashy party, guests enjoyed a daytime ribbon cutting ceremony and champagne-sabering, a tradition of the St. Regis brand. The ritual dates back to the time of Napoleon – tres cool. St. Regis Global brand leader, Paul James, CEO of Starwood Vacation Ownership, Sergio Rivera and General Manager, Marco Selva were joined by notables including Bal Harbour Village Mayor, Jean Rosenfield, Christina Getty-Maercks, Susanne Birbragher, Executive Director of Tourism for Bal Harbour, Carolyn Travis, Lea Black and designers George Yabu and Glenn Pushelberg, who gathered for the unveiling of the 28th property in the St. Regis portfolio where butlers lined the grand entrance of the resort and residential property that soars above a 1,000 foot stretch of pristine shoreline as Mayor Rosenfield presented Selva with the Key to the Village. Afterwards, the pair joined James and Rivera to cut the ribbon and welcome the noteworthy roster of attendees inside for a first look. Guests were given the opportunity to tour the landmark oasis that represents one of the most significant openings in the brand’s history. The St. Regis Bar was buzzing while guests enjoyed a selection of delicious hors d’oeuvres, the signature St. Regis Red Snapper Bloody Mary, and a live jazz band. Last week Absolut vodka, a crowd pleaser for decades, celebrated its own revamp of sorts with the launch of its sixth limited edition, city-inspired flavor—ABSOLUT MIAMI which comes in a gorgeous Art Deco designed bottle and tastes of passion fruit. Thousands of party people gathered on the lawn of the Fontainebleau to celebrate with free-flowing cocktails and terrific dance music while experiencing this key ingredient of Miami nightlife- Absolut vodka (responsible in part for certain club-goers’ progeny- TMI!). 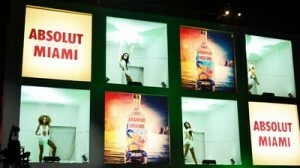 The Absolut Miami launch party featured a special guest performance by singer/songwriter SANTIGOLD- who performed atop a custom designed Lucite stage and display case. Her indie songs and energy worked the crowd into a frenzy, especially when she invited guests to join her on-stage. 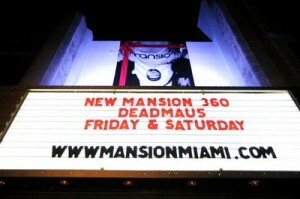 Miami’s elite turned out en masse on January 21 to celebrate Mansion nightclub’s mega revamp and grand reopening. The “new” Mansion includes outrageous lighting and sounds, which drew throngs of fans for two nights of special performances by Deadmau5, who reportedly charged over $200k. The opening was a cross between Walt Disney World’s Electrical Parade, The Wizard of Oz and a South Park episode- with psychedelic robots, “little people” in silver futuristic suits and Deadmau5’s deformed Mickey Mouse-esque logo-characters, who entertained Miami’s VIPs on the opening night of Mansion’s rebirth. Don’t Miss: A Celebration at Yardbird, PAMM Participates in Blue Star Museums, and Brownes Merchants & Trading Co.